Born at Ste. Anne on 15 April 1894, son of Joseph Pierre Hébert (1853-1934) and Cordelia Hébert (1857-1929), he was educated at St. Mary’s School (Winnipeg) and St. Boniface College. His first job was as a cash boy in Robinson’s store in Winnipeg. He later worked as a financial broker, was a Notary Public, and had the sole distributorship for the Free Press in St. Boniface. On 3 August 1915, he married Andréa Valcourt (1892-1961). They had seven children: Germaine Hebert (1916-1985, wife of G. Schoenau), George Hebert (1917-1996), Bertha Hebert (1919-2003, wife of E. Barker), Claude Hebert (1921-1992), Romeo Hebert (1923-2016), Roger Hebert (1930-1998), and Claudette Hebert (1932-2008, wife of Ernest A. Regan). 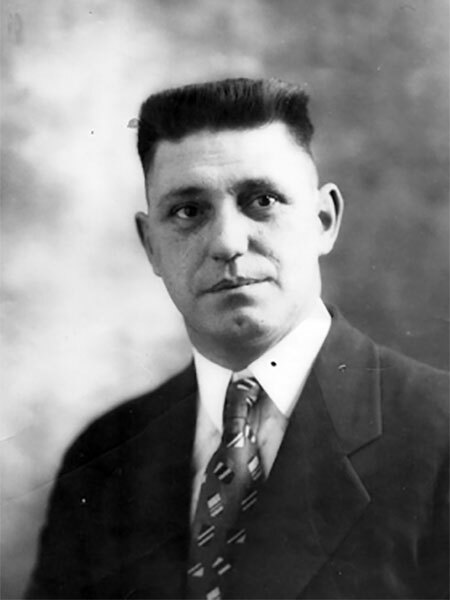 In 1920, at the age of 26, he was elected Alderman for the City of St. Boniface, the youngest such person to that time, and served for nearly 30 years (1921-1928, 1933-1937, and 1941-1950), including a term as Chairman of the Finance Committee (1923). He served on the Federal Farm Loan Board (retiring in 1960), Sanatorium Board of Manitoba, Metropolitan Town Planning Committee (Chairman), Land Inspectors Association (Life Member), Metro Board of Appeals (retiring in 1971), and Liberal Party of Manitoba (life member). He organized an annual “Pea Soup Night” under the auspices of the St-Jean-Baptiste Society (of which he served as President) to which MLAs of all political parties were invited. He was a member of the St. Boniface Kiwanis Club (President), Director of the Knights of Columbus (Winnipeg Council), and Roman Catholic Church. In 1925, he lived 850 Tache Avenue, St. Boniface. In recognition of his community service, he was inducted into the Manitoba Order of the Buffalo Hunt. He died at his Winnipeg home, 740 Tache Avenue, on 18 May 1972 and was buried in the St. Boniface Cemetery. Hébert Street in North St. Boniface was named in 1922 to commemorate his family’s contribution to the area, especially that of his father who lived and did business there for 50 years. “Personal and social,” Manitoba Free Press, 4 August 1915, page 39. “Joseph Hebert, pioneer of west, dies at age of 82,” Winnipeg Tribune, 27 June 1934, page 7. Obituary [Andrea Hebert], Winnipeg Free Press, 20 November 1961, page 28. Obituary, Winnipeg Free Press, 20 May 1972, page 39. Obituary [Claudette Regan], Winnipeg Free Press, 9 February 2008. We thank Jean Hébert for providing additional information used here. This page was prepared by Gordon Goldsborough and Kevin Rosger.